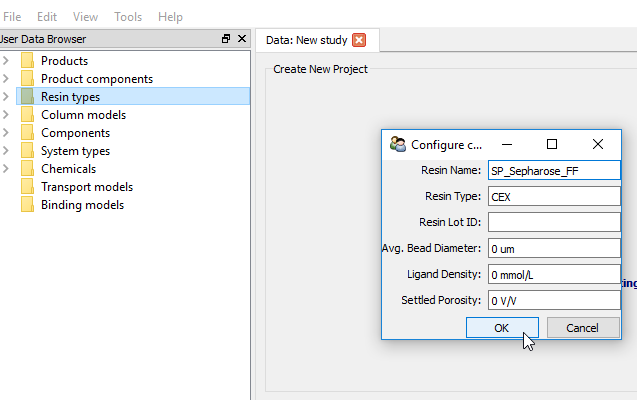 This portion of the user manual will teach users how to create custom elements (i.e., elements that do not come pre-loaded in Reveal Chromatography) like products, binding models, transport models, etc. Products , and the product components involved in their composition. These are used to specify the properties of the protein being studied. 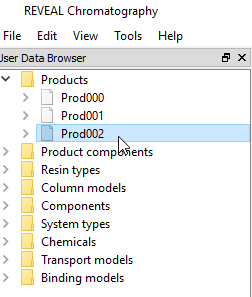 To provide an example, a sample product PROD000 is included in the default User Data. Column models , which contain column models and their manufacturer specs (column diameter, bed height limits, etc.) to define studies’ packed columns. Resins and their manufacturer specs (ligand density, average bead diameter, etc.) which can be used to further specify studies’ packed columns. Chemicals and their components , which can provide building blocks and specs for building study solutions. A limited number of chemicals are pre-loaded into the software. Systems , which provides a place to specify chromatography systems, and their specifications (number of inlets, etc.). Four models of AKTA systems are currently included in the default User Data: the AKTA Explorer, AKTA Purifier, AKTA Pilot, and AKTA Avant. Reveal Chromatography also supports storing transport models and binding models for existing products. These models may be used in building future simulations. The models are typically copied from the study data browser and pasted into the User Data at the end of the model calibration phase for storage or sharing. 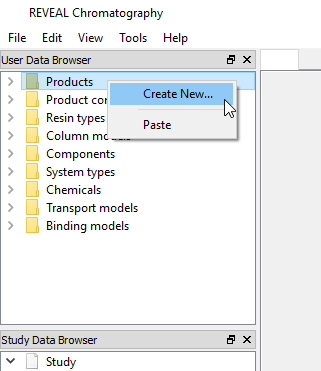 In general, users may create and contribute custom elements to the User Data by following the same steps: right-clicking on a folder, selecting Create new, specifying the details and specifications of the custom element, and clicking OK.
A new window will open, wherein users should specify the details of their desired new resin. In this example, the resin is called, SP_Sepharose_FF . The Lot ID field (for resins, loads, and other custom User Data elements) is optional and is meant to be used for administrative purposes of tracking which batch a given chromatography element came from. 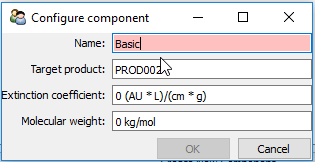 Additionally, it is important to note that when changing unitted values (e.g., ligand density) users should only edit the numerical characters in the text box. Editing the unit (e.g., mmol/L) is not currently supported by Reveal Chromatography. Once the appropriate details have been specified, click OK to continue. 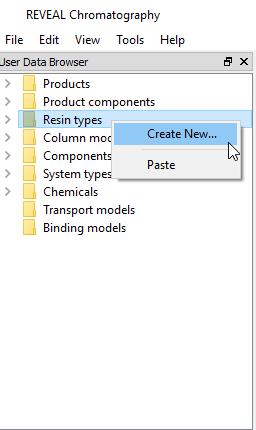 The new resin will now appear in the Resin types folder in the user data browser. Adding a new product is more complex than other User Data element creation. However, it is one of the first steps that a user must complete in order to load their input files. A new window will open in which a user is prompted to enter a name for the new product, the product type (e.g., globular, fab, conjugate, etc.) and the isoelectric point of the protein (usually denoted pI). Note that product names must be unique. If a non-unique product name is entered, the text box will highlight in red. Once a product name is set, Reveal Chromatography can search with User Data for a product component that targets said product. Click the Add Components button to select existing components to add to a product definition. 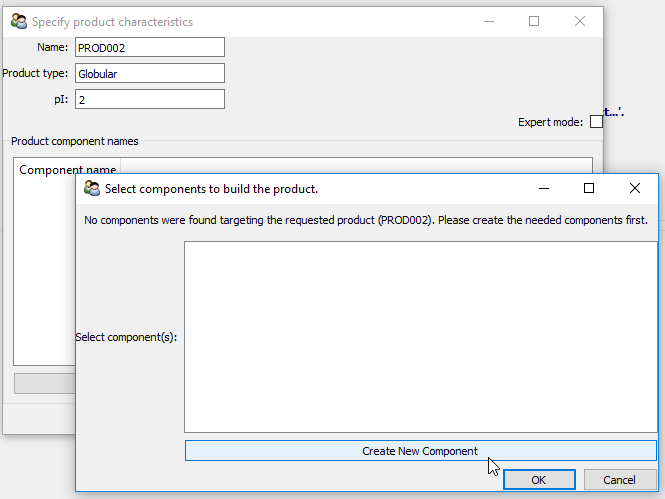 Note that the Target product field will automatically be populated with the name of the product that is being created (in this case, PROD002 ). Repeat this process for as many components as needed to describe the new product. When finished, use shift-select to select all the components to include in the new product and press OK. 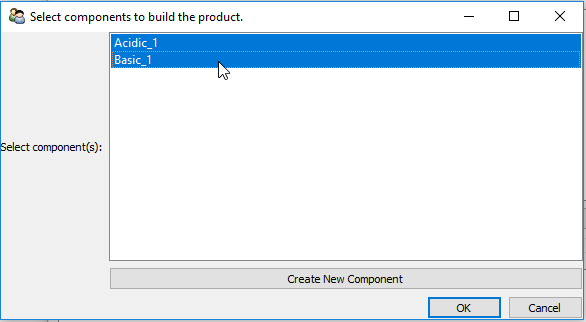 Components will then appear in list of components in the product definition in the main product creation window. 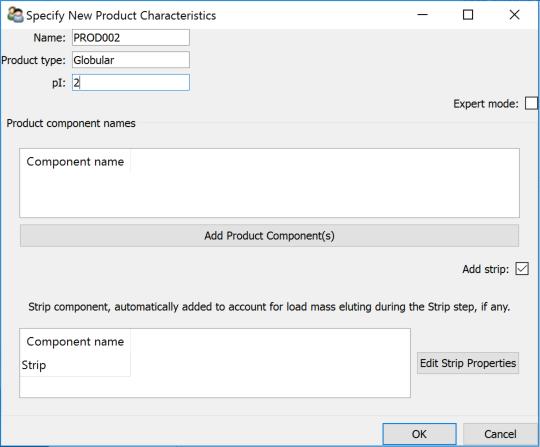 When defining a product’s components, one component is often added to account for the fraction of product which doesn’t elute until the Strip step if any. This may be a separate protein species which binds more tightly to the column, or a certain amount of the regular components which doesn’t elute during the Elution step. That component isn’t typically part of the make up of a Load solution as described by analytical process, and yet, behaves by definition differently from the regular components. As a consequence, it must be modeled as a separate component, with separate binding and transport model values. The Strip component can be removed by un-checking the Add strip box. But it is recommended to leave it part of the product definition, since its impact (or lack thereof) can be controlled experiment by experiment, once data is loaded and its impact can be seen in chromatograms. See the dedicated section on the Setting the Strip fraction (Optional). 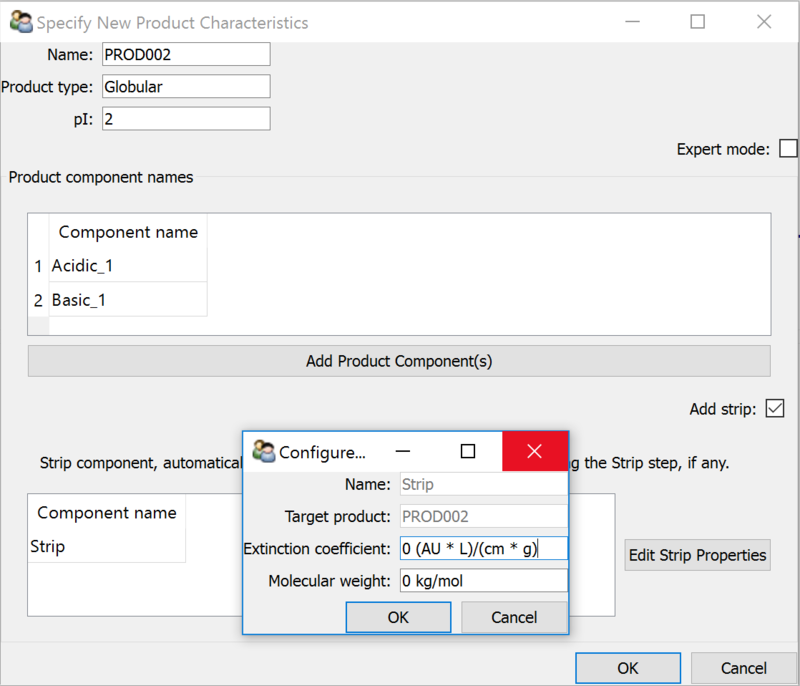 By clicking the Expert mode box in the product creation window, users have the option to completely control the component composition, including the expression to compute their concentrations based on the assay measurements/fractions. This mode is not recommended for new users. 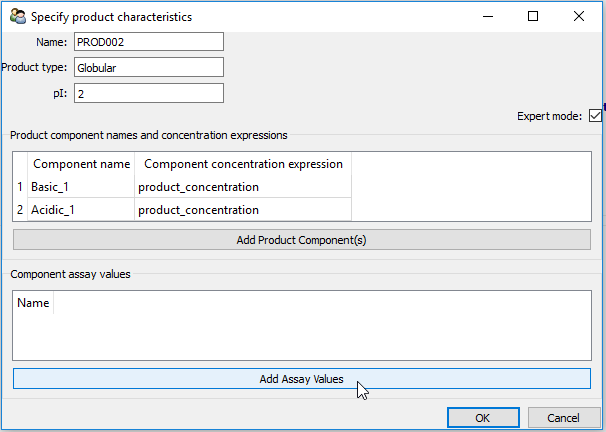 In the expert mode, users must specify the needed product assays and concentration expressions for every product component. 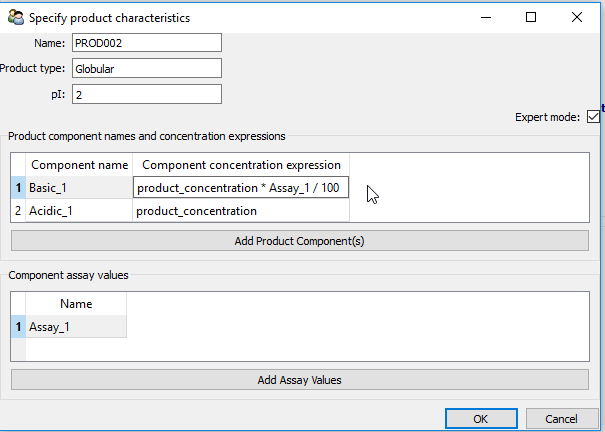 This mode is relevant for users who wish to split up their product component amongst more than one assay, for users who wish to have the concentration of a component involve more than one fraction, or for users who wish to control the names of their product assays. By default, Reveal Chromatography will assume that each product component is defined by one assay value and that the concentration of the component will be computed as the fraction for that assay value (read from the Fraction data tab of the input file – see Preparing experiment input files), multiplied by the total product concentration, and divided by 100. 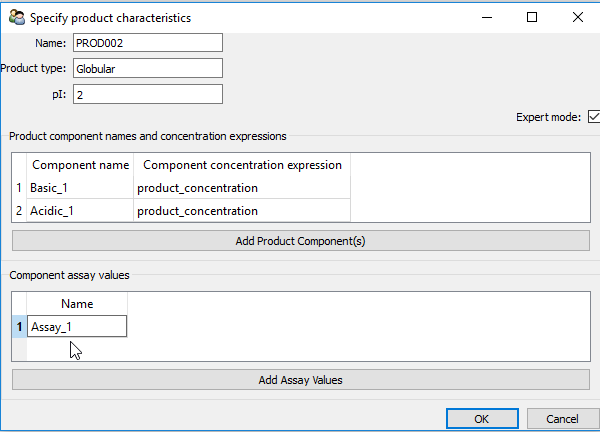 The program also assumes that assay values are named in a similar manner to components. The input file created in Excel must reflect this (see Preparing experiment input files). To create a product assay for the custom product users should click the Add assay button at the bottom of their open window. Users should then double-click on the newly created line of the assay table, and enter the name of any assays they wish to have included. Concentration expressions for components can also be edited by double-clicking on the “Component concentration expression” field next to the desired component, and entering a custom expression. When the desired modifications are completed, press OK. 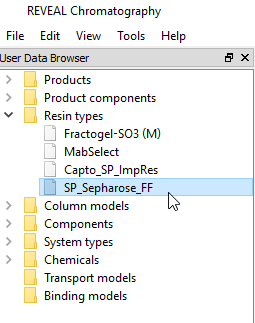 The custom product now appears in the Products folder of the user data browser. By opposition to user data , study data contains data that used to build a specific study, around a specific product. These data elements are used as building blocks for experiments, as well as simulations. Typical studies are built around a set of experimental data, collectively loaded from experimental study files, as described in Preparing experiment input files. 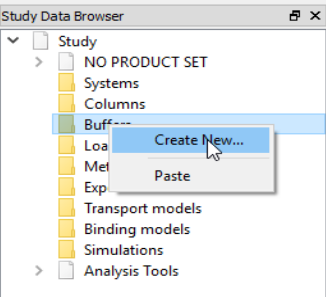 When loading such experimental study file, all buffers, loads, columns, systems, and methods are loaded and populated into the study data. Then, fill up all the characteristics of the new data element and click OK. The new element should then appear in the Study Data browser, and be accessible in the tree to be double-clicked on and reviewed in the central pane. See also Creating new binding and transport models for details about creating new transport and binding models.